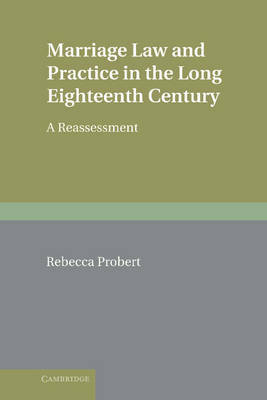 This book uses a wide range of primary sources - legal, literary and demographic - to provide a radical reassessment of eighteenth-century marriage. It disproves the widespread assumption that couples married simply by exchanging consent, demonstrating that such exchanges were regarded merely as contracts to marry and that marriage in church was almost universal outside London. It shows how the Clandestine Marriages Act of 1753 was primarily intended to prevent clergymen operating out of London's Fleet prison from conducting marriages, and that it was successful in so doing. It also refutes the idea that the 1753 Act was harsh or strictly interpreted, illustrating the courts' pragmatic approach. Finally, it establishes that only a few non-Anglicans married according to their own rites before the Act; while afterwards most - save the exempted Quakers and Jews - similarly married in church. In short, eighteenth-century couples complied with whatever the law required for a valid marriage.